Nico Rosberg will drive Juan Manuel Fangio's 1954 Mercedes W196 at the Nurburgring next weekend in a demonstration run on the daunting Nordschleife. The W196 won the 1954 German Grand Prix as well as three other grands prix that year and five more in 1955. 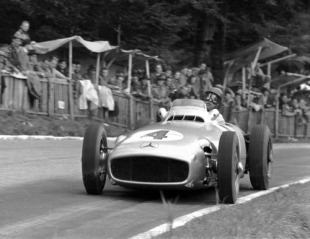 The 1954 event at the Nordschleife was the first race the car ran with open wheels after Fangio experienced problems with the famous streamlined bodywork at the British Grand Prix. "Coming to the Nürburgring for the German Grand Prix always feels very special to me," Rosberg said. "There is so much history around this amazing track, especially for Mercedes-Benz with great drivers from the past having had such successful times on the Nürburgring and the legendary Nordschleife. "This year, I will have the opportunity to drive Juan Manuel Fangio's car from 1954 on the amazing old circuit, and that will be very special." For more on the Mercedes W196 click here.